Donald Trump can’t help himself. Even after the third presidential debate, he stood Thursday before an Ohio rally and couldn’t give in. Instead, he said he would “totally accept” the election results. That’s a version of the Trumpian catch-all clause that is probably in all his contracts. What did the self-proclaimed “man who never settles” do to change the perception on debate night that he’s a whiny bad loser who will win at all costs? And if you’re Asian American, Trump’s answer is more troubling than he thinks. Republicans? Democrats? Here’s what counts. Asian Americans are predominantly a foreign- born U.S. group. There are more than 11 million from Asian countries living in the U.S.
That’s approaching two-thirds of all Asian Americans in the U.S.
You bet they were watching the third debate. So were many other foreign-born Americans in our country, more than 41 million total. They know by their presence that America is the land of opportunity, of political freedom and expression. And all of it is backed by an ironclad constitutional guarantee. These Americans escaped hardship, repression, and, in some cases, political torture. They willingly renounced their land of origin to come and participate in this great American democracy. 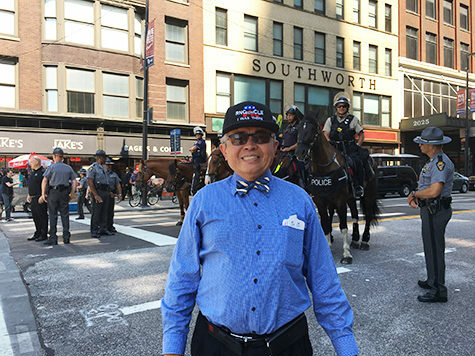 Remember the great Filipino leader, Sen. Benigno Aquino, who lived here in exile in Massachusetts and Texas, escaping martial law in the Philippines? He later returned to his homeland in 1983, only to be assassinated on a Manila tarmac. The Philippines, a former colony, has a democracy made in the image of the U.S.
What do you think goes through the minds of the five million American Filipinos when the standard bearer of the Republican party in the U.S., one of the standard bearers of democracy in the world, is asked point blank if he would accept the official election results? Flores said Trump and his rallies reminded him of the dictator Ferdinand Marcos. “He always drew huge crowds and won,” he told me. Flores left the Philippines because of Marcos. Soon after our exchange, Trump came out and did his tease, that he would accept the election results—if he wins. “That is more than funny,” Flores told me with a bit of ironic sadness. Flores remains conflicted. He doesn’t like Clinton and is like a lot of conservatives who are trying to navigate around Trump. Flores says he will still vote for the Republican, but now is convinced Trump will lose the election. It’s clear that Trump doesn’t think taking a tough guy stand on election results will hurt his base. But maybe they’ll be mad and just not vote. Still, to those who are here in America because they know the likes of dictators, juntas, martial law, and the real examples of a rigged elections, the Trump clause invoked after the debate–“If I win”–made Trump no different than a Third World politician. Trump is the candidate that true freedom-loving people of democracy must run away from and repudiate.